Attention to detail. Retro-techno. Custom equalization. Fully portable. Fashion statement. Imaginative design. Conversation piece. Decent FM radio. Loud. Accurate midrange and treble. Rich bass tones. Suitable for all genres. Magnetized remote. iPhone/iPod security brace. Massive rubberized handle. Written manual. The boombox is back. Are you happy with this news, or are you running for cover? 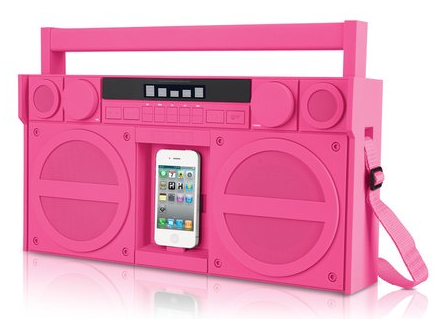 Today’s iPhone/iPod boombox is very different from its predecessors. iHome Audio’s iP4 is fully digital, sonically accurate, and ready to rock or help you relax, as you prefer. Let’s get one thing straight. If you are primarily concerned about environmentally responsible portable boombox blasting, buy and use rechargeable batteries for this and all other removable battery equipment. You also can skip this product and instead spend a little more for a solar-powered Soulra XL, reviewed here. Important: equalization on iHome Audio’s iP4 boombox is far superior to Soulra XL; the latter has a better shoulder strap. Now that we’ve moved past environmental consciousness and product comparison, we can confirm that iHome’s iP4 is a great speaker. It looks good, comes in three different colors, sounds terrific, is well-engineered, and goes everywhere. • Remote control unit that is responsive, easy to use, and that stows flush to the top of the speaker housing via a handy magnet. • Five-band equalizer on the front deck with eight increments per band. • Strong bass response that has exceptional clarity without any annoying or excessive boom. • FM antenna that plugs securely into the AUX port. • Negligible distortion at high volume ranges. • Sturdy construction that can accommodate a bottom-weighted battery compartment when used away from AC power. There are plenty of speaker docks in the $200 price range, but none of them has the amazing appearance, especially in pink or blue, of iHome’s iP4. This is a boombox you can carry, but it also is a sophisticated speaker system for docked and AUX audio, plus FM radio. Visitors make fun of our pink demo unit, but within minutes people are awed by its performance, indoors and outside. She is correct. We were sitting outside on our patio for hours, conditioning the unit’s speaker drivers, enjoying a 60’s playlist I use for speaker testing. Each hour of listening sounded better than the previous one. By hour four the speakers were beginning to approach their sonic potential. There is no “best” iTunes EQ setting, it’s a matter of preference. It depends on your taste; the equalizer allows for what sounds best to your ears, given the music that you enjoy and is likely different for different people and music genre. And make sure that the SRS Trubass button is set to on (it should be lit up) for the best sound experience. Battery performance at max volume: 20 hours; at half volume: 76 hours. So at a normal volume, you should see 30-50 hours of battery life. Regular alkaline batteries will work fine. Regarding the speaker conditioning or break in period, our products are good to go out of the box and are tested as such. While letting the speakers run at around 70 percent volume for a couple of hours may “mellow them up” a little bit, there is really no harm in turning the product all the way up right out of the box. The iP4 has carbon-composite speakers of a very high quality, as we anticipate that people are going to use this product at high volume pretty often. MyMac Review Rating: strong 8 out of 10.